This grand 400 km (250mile) route from the Channel Island of Jersey to Central Paris is a classic - with an Adventure Cafe twist. We are sure this unique Adventure Cafe event will inspire and enthuse those who are new to the sport, as well as the experienced cyclists out there who want a beautiful cycling challenge. 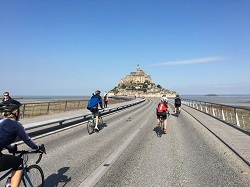 A multi-day ride, landing on the shores at St Malo, taking in all the rural beauty of Normandy's back-roads, and culminating in a finale in Europe's most romantic city at the end. We will depart the shores of home on a morning ferry, landing an hour and a half later in St malo, where the ride will begin. 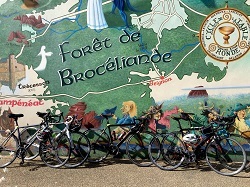 Our French ride takes us through the attractive Normandy countryside, several National Parks, charming French villages and quiet rolling roads. We cycle on through the historic catherdral city of Chartes then on to our approach to Paris. We will eventually ride right around the impressive Arc de Triomphe to the Place du Trocadero before swooping along the grand Champs Elysees to our finish point bang in the middle of the excitement of Paris. The evening is then yours to enjoy; celebrate in this beautiful and culturally vibrant capital. You are accommodated in Paris and the following day (aching legs permitted!) you are free to sample the delights of city before catching the train / flight directly back to Jersey. Pre-Event Meet at designated team hotel in London for pre-event briefing and dinner - 18:00. Stay overnight at hotel - optional, not included. A fairly undulating ride though Normandy's National Parcs and forest lands. We will take reguklar breaks and stop for lunch in one of teh lovely French villages we find at around halfway through the ride. Our destination for teh evening is teh town of Nogent -le- Rotrou, which you can will have few hours to explor before getting a good night's sleep! Today we have more beautiful French countryside and quiet roads...and a long ride for the final push into the capitol. We will approach Versailles and its famous palace before starting to meet the city as we cycle through the busy suburbs. As we near the city centre you will be greeted by all of Paris’ famous sites such as the Arc De Triomph and the Eiffel Tower. Congratulations you have reached your destination! You will have some time in Paris before catching the Eurostar from Gare du Nord or a flight directly back to Jersey and retrieve your bike. We will be using comfortable and clean good quality hotels along our route. You will be sharing in twins or triples. If you require a single room then please request this at time of booking (a small supplement will be payable). Upgrades may also available for an extra charge if required. Although it will be summer, expect possible showers. It is wise to prepare for all weather types, you never know we may be pleasantly surprised! It is possible to include lunches and/or dinners for an additional charge. Single rooms are available for an extra charge.